t*rexes and tiaras: Tuesday Titles 161.. I've got to admit, I went into this moving house business a little naively, genuinely believing I'd be all unpacked and everything would be located by now. Instead, it's mountains of boxes everywhere and whilst I kind of know where the boxes are which contain the things I wish to find, I don't know how to access them. I know it will get there, I'm just clearly too impatient. Anyway, I guess what I'm saying here is that I haven't had chance to read as much as I'd like to lately. My to-read pile is crazy and of course I found more to add to that when I was packing up all of the bookshelves. Argh. 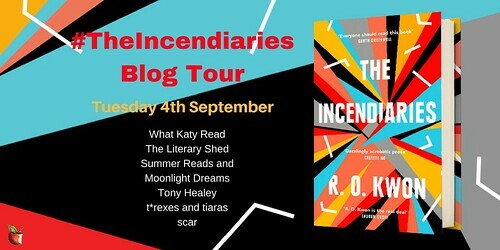 But I'm rather pleased to be part of the blog tour for a lovely new book: The Incendiaries. I struggled to get into this one because it uses the super annoying method: dialogue with no quotation marks, which I really struggle with. However, once you look past that, it's a novel about fitting in. Our three main characters are Will, Phoebe and John Leal and the chapters whizz between each points of view. Will's main aim is to establish what had happened to cause Phoebe, his girlfriend, to be involved in something horrific. Since he spends a lot of his time leading up to the events being confused by her actions anyway, his thoughts can be rather hard to follow. Eventually as the story unravels and things begin to make sense, with the reader left unsure who to actually tolerate, let alone like. Whilst it was good to get an understanding of things leading up to the horrific events, I'd have liked to get more of an insight into John Leal and the cult he was a part of. His story was only really mentioned by Will. 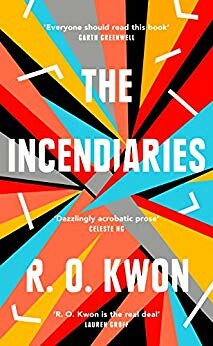 I read somewhere that this book was pipped to be another Little Fires Everywhere but I'm afraid I don't see it. I'd recommend it as an intriguing read, provided you can look past the flowery prose and the lack of quotation marks. See what the others thought on the blog tour, which continues all week. I don't get why authors do that with no quotation marks and, indeed, why editors and publishers let them get away with it. I find it equally vexing. Good luck with box mountain. I remember that too! Luckily, we did move things in dribs and drabs so it wasn't as bad as it could have been! I'm feeling a little sense of joy everytime I get another box unpacked and flat-packed. The lack of speech marks is one of the most annoying things in books, ever. I don't know why you'd ever think to write like that.